Word Mania Boosts English Skills Around the World! Almost 400,000 school students from 100 countries improved their English literacy skills by participating in the world’s biggest school literacy competition, Word Mania International. Run by LiteracyPlanet for Years 1 to 9 (5-14 years), the Word Mania competition is based on a digital word building exercise that challenges students to create as many English words as they can from a board of 15 randomly generated letters in three minutes. Students from 2,500 schools across North and South America, the Middle East, Asia, Africa and Europe competed in the inaugural international edition of the popular competition. Many learn English as an additional language. Students spent 4.8 million minutes - the equivalent of more than 9 years - playing 1.6 million Word Mania games and building more than 35 million English words. Some schools were well resourced and their students also had internet access at home. 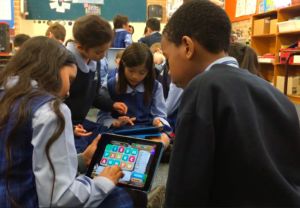 Some schools might have had one tablet device per class, shared by students on a rotation basis. What they all shared in common is a desire to help their students develop strong English skills. Word building involves various literacy skills including phonics, word families, rhyming and root words, affixes, spelling, vocabulary, word recognition and word knowledge. The Word Mania competition has been shown to dramatically improve English literacy skills, with average game scores increasing by 36% and the average number of correct words per game increasing by 20%. David Weston, Commercial Director International for LiteracyPlanet, said the popularity of the competition reflects the growing use of digital technologies in school education and how effective they can be for learning: “At LiteracyPlanet our goal is to make learning English fun. Students enjoy using digital technologies to learn, and research shows that students being engaged and motivated is a key factor for better learning outcomes. “For many children, especially if English is not their first language, developing good English skills can open doors to work and better socio-economic opportunities. We can see from the Word Mania data that students’ English literacy skills improve noticeably over the few weeks of the competition, and we are thrilled to bring fun learning into so many classrooms around the world, and be part of these children’s English learning journey”. He added that the winning schools deserve to be proud of their achievement: “Word building is a complex literacy skill. With thousands of schools around the world vying for the top spots in each year level, students at the winning schools deserve to be very proud of their efforts”.